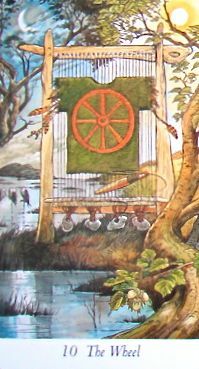 Today's Draw Classic*: The Wheel from the Wildwood Tarot. Are you ready for a change? Are you going to make it happen or would you prefer it happen to you? This week's readings are signaling something transformational on the horizon. Does that excite you or scare you? The Wheel (also called The Wheel of Fortune) traditionally talks about the seasons or cycles in our lives. This particular Wheel, however, also speaks of how we weave our own destiny. It's not a wheel turned by the fates like other representations, it's a loom upon which we weave our own fate. I believe we come down here for a purpose and with lessons to learn/challenges to face. But for the most part, we're writing and rewriting our story down here. Some achieve more than expected spiritually in a lifetime, some less. Some repeat the same lessons over and over, others get it on the first try. Some walk through life with personal power, others feel powerless. All of that is up to us. The circumstance or challenge we were born into wasn't up to us, but what we do with it is. At the same time I say that, I also believe I had knowledge of certain parts of my life as a small child that are only just now beginning to unfold....as if they were always part of the plan, only I forgot. So I do think certain parts of our lives are inevitable and I believe we're also guided once we're down here. But ultimately we set the intentions and the paths to get there. And with each spin of the wheel we have an opportunity to start fresh, build on what we've achieved or have a re-do. I think I may have told the story before about how, when I was a kid, we moved every two years. And because I had a hard time making friends, I was generally unpopular. But every two years I had a chance to reinvent myself. So while I lost all the traction I had gained while I was in one place (which sucked), there was always that magical air of it maybe being different the next place we went. Of course, it never quite was...haha. That was largely due to the fact that I never changed the things that might have stood between me and friendship. I was always overweight and teased. I was bossy. I was smart. I was somewhat introverted, sullen and angry. A little spoiled, too, I suppose. And, for my teen years at least, I had adult responsibilities and embodied the "unfairness" of all that. From 12-14, I was the family cook, cooking for 6 every night after school. So there was little playtime available to get to know people. And at 16 my mother got cancer and I was faced with the prospect of losing the parent who had raised me (my father worked a lot). Anyway, after a while (and through a lot of conscious work), my feelings of powerlessness and victimhood turned to power and personal responsibility. I stopped blaming others for who I was and what I'd become and started making changes. I stopped coming from a standpoint of anger and self dislike and started realizing that my happiness was my own to claim. And, as time drew on, I stopped weaving false frocks in which to show myself to the world and started weaving ones more authentic to me. I feel like I've been a bunch of different people as an adult, in the sense that I've healed a number of the things that drove my personality and the way I carried myself through the world at any given time. I'm not the same person I was three years ago, let alone five or ten. And while I think I'm pretty groovy now, I'm still excited at the prospect of some new facet coming to the fore. Even if it's a "lemon" facet, I know I'll make lemonade out it, because that's the person I've become. There are so many theories on what life is about. But even if you believe it's all chaos and there's nothing before it and nothing after it, it's still a pretty cool gift that we get to be here and think about it. That we get to love our people and pets. Dream of possibilities. Pick ourselves up when we fail. Have wins. And learn from losses. The Wheel comes to tell us that if there's something we don't like about our lives, to change it. We have that power. Crap is going to happen either way, but the difference between those who feel powerless over it and those who claim their power over it is all in the jasmine and magnolias we choose to smell along the way.